i went to two point oh LA's 2nd event, the bloggers' cafe launch, on monday night. it was held at the fashion los angeles offices in downtown LA (look at those pretty buildings! sigh. what a view). i've had this skirt in my closet for a few months and had no idea what to wear with it. 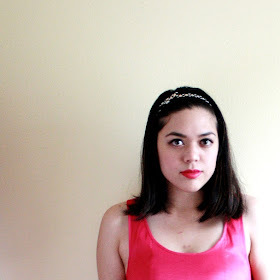 i hadn't worn the floral bustier yet either, which i got at zara when i was in san francisco. i tend to buy things on a whim and realize too late that i might not have anything that goes with it. good thing they made the perfect pair! now on to the event itself! i spent the night socializing with some of the most stylish people in the city, including bree of the stylist diva, heather of LA fashion snob, steph of three quarter sleeve, kelsi of dedicated follower of fashion, and more. it was fun seeing new faces and getting to know other bloggers face-to-face (but nicole, you were surely missed!). we also feasted on yummy guacamole (thanks, yucatan!) and cheese + crackers. the purpose of the event was to inform us of fashion los angeles' new partnership with two point oh LA, and the first bloggers' café, which will take place in a couple of weeks during fashion's night out at the grove. i'm really excited for it! bloggers' café is a bi-weekly event where designers and brands can present and promote their products to us bloggers in a setting that encourages interaction and discussion. hope to see you there, my fellow LA fashionistas!